Full Name: Charles “Charlie” Moss Duke Jr. Spent three years as a fighter-interceptor pilot with the USAF stationed at Ramstein Air Base, Germany. September 1965, Graduate of the USAF Aerospace Research Pilot School, where he remained as an instructor until selected by NASA. 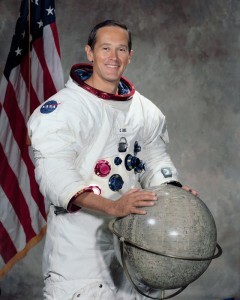 April 1972, LMP on Apollo 16, where he and CDR John Young spent three days at the Descartes Highlands landing site exploring the region during three EVA’s. 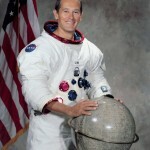 Retired from NASA and the USAF (at the rank of Brigadier General) in 1976 to pursue private interests. He is the owner of Duke Investments and the Founder & President of Charlie Duke Enterprises. More recently he founded the Duke Ministry for Christ where he works as a speaker and Christian Lay Witness.